Without getting preachy, I’ll just say that I’m not a fan of Black Friday here in America. It’s all just too much. So I’m making a simple offer. 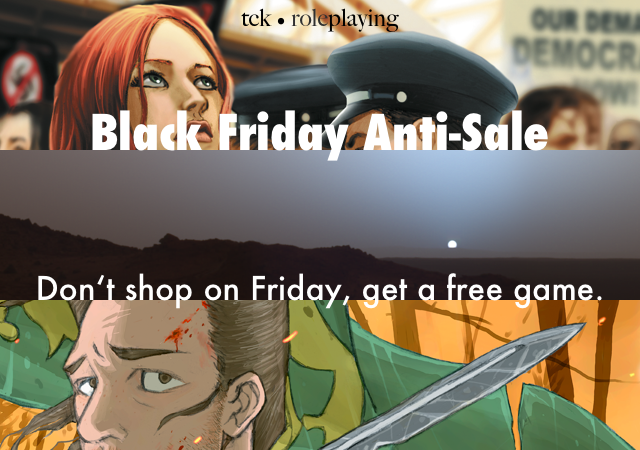 If you email me (tim@tckroleplaying.com) on Saturday, November 28, 2015, and pledge that you did not shop on Black Friday, then I will send you any one of my games for free (PDF only). That includes Hero’s Banner: The Fury of Free Will, Mars Colony, and Mars Colony: 39 Dark. And that’s it! Free game. All you have to do is not shop for one day. Small print for the rules lawyers: Yes, this is on the honor system. Keep the spirit of the challenge in mind. If you need to, for example, take a taxi to get home, that’s fine. But try to plan ahead and purchase what you need beforehand. You can do it! This is an individual challenge, which means a few things. First, if your spouse buys something, that doesn’t affect your ability to get a free game. Likewise, if you have two other family members, and neither of them buy anything, everyone can get a free game. However, if you tell your spouse to shop on your behalf, then you’re cheating — no game for you. This entry was posted in Announcements and tagged Black Friday, Free, Protest on November 24, 2015 by Tim Koppang.